There is power in a union. There is power in art. 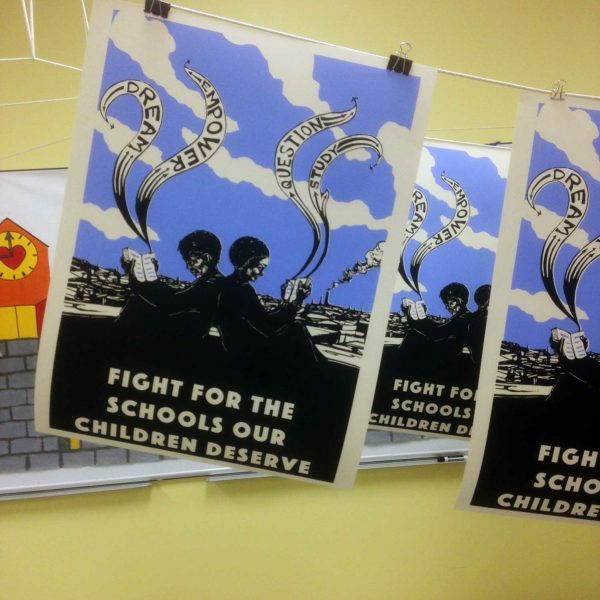 The union’s current organizing campaign revolves around the push for smaller class sizes, reduced standardized testing, greater teacher control, and $15 Minimum Wage for all district employees – a key struggle considering that MPS remains exempt from the move to a city-wide minimum wage of $15 per hour. 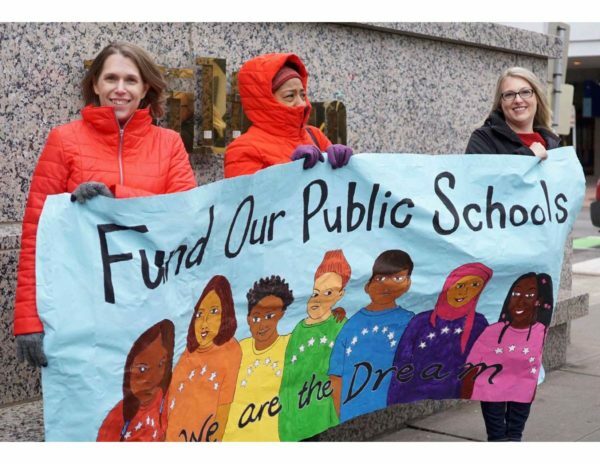 The Minneapolis and Saint Paul Federation of Teachers embrace social justice unionism: the intersectionality of movements and the solidarity with struggles outside of the demands of advocating for the rights of unionized workers. 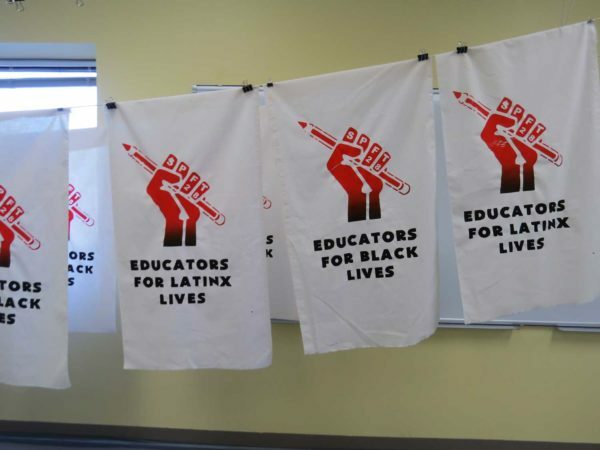 The key messages of the picket signs slogans exemplified this emphasis on social justice unionism: Educators for Black Lives, Educators for Native Lives, Educators for LatinX lives, and Educators for LGBTQ lives. 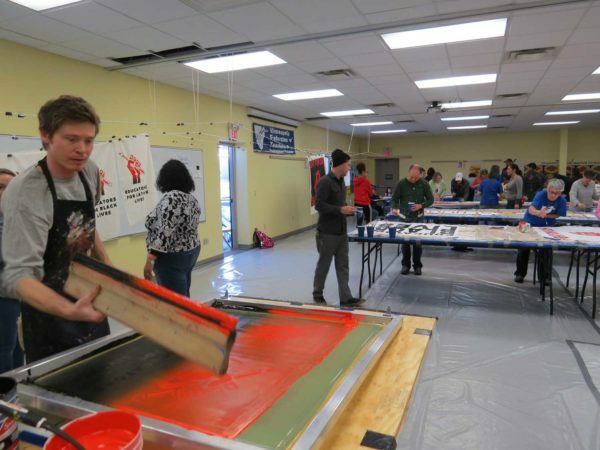 The art build was organized by Nate Gunderson of the NEA (National Educators Association), Michelle Wiese (President of the Minneapolis Federation of Teachers), Nick Faber (President of the St. Paul Federation of Teachers), and myself. 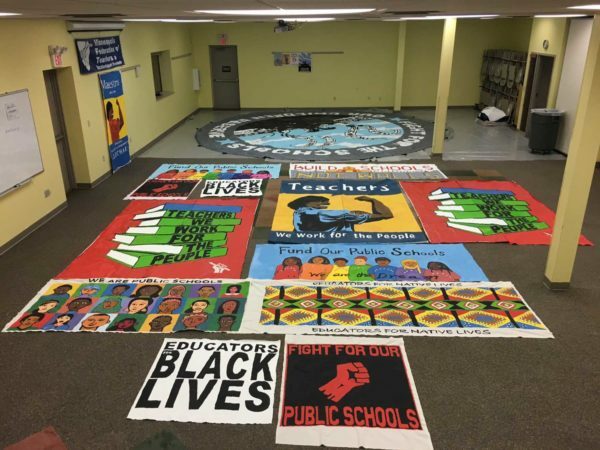 Nate – based in Minneapolis – had reached out to me after seeing the documentation and hearing about the buzz during and after the art build for public education in Milwaukee in February 2018 that was organized by MTEA (Milwaukee Teachers’ Education Association), and specifically Joe Brusky. Nate convinced the Minneapolis and the Saint Paul Federation of Teachers about the power of art builds and we all went to work to make one happen on the scale of Milwaukee, if not larger. We began the way that we always do: the union makes the decisions and informs the artists on the slogans and image ideas that artists should consider when they begin the design process. This committee then assigned a point person from inside the union to help organize the art build. 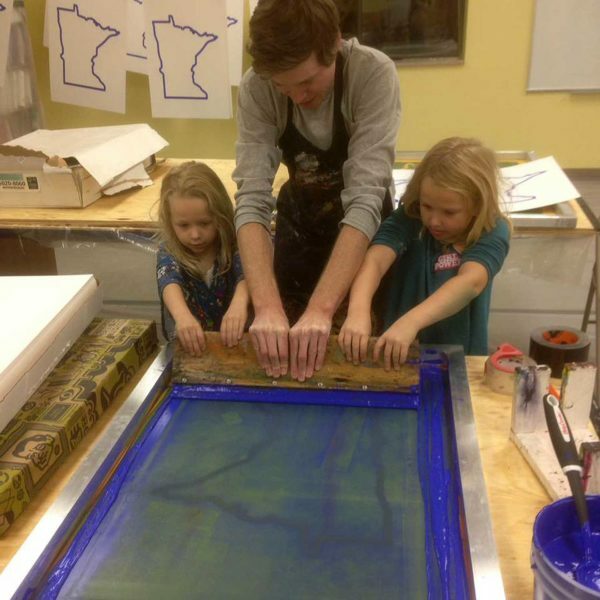 Nate took on this role and he reached out to art teachers in both the Minneapolis and the Saint Paul public schools to begin designing with a due date set for drafts. He also invited myself to create designs, as well as others within my network of activist-artists (specifically the Justseeds community of artists.) 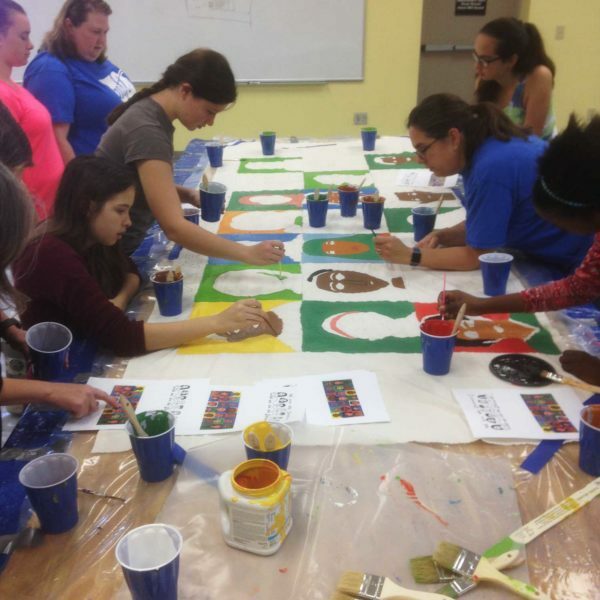 The goal with all art builds is to activate everyone: to strike a balance – where an equal amount of art is created from both public school art teachers, and students, as well as allies outside of public schools. Public schools truly are the heart of the community and the issue impacts all of us so every voice matters. What was amazing about this art build was not only did a number of Twin Cities art teachers prioritize this call for art – particularly (Mina Leierwood, Jill Michell and Kathleen Cassidy), but they also shared the call and the design challenge with their students. 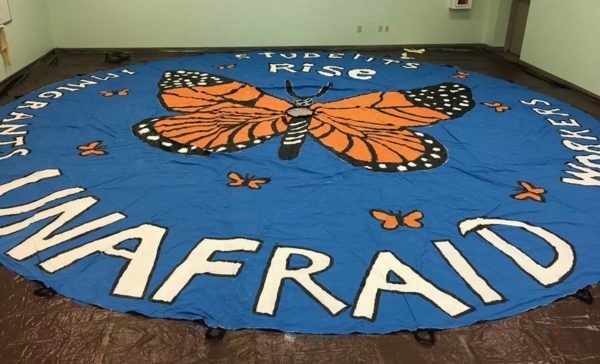 One epic example was a parachute image that was designed by a fourth grader – a powerful design of the butterfly image for immigrant rights with text that read: Students Rise. Immigrants. Workers. Unafraid. When the deadline for images arrived the art build committee within the union had an ample number of images to choose from. 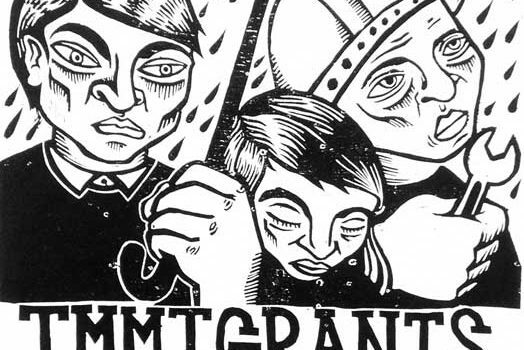 If we were missing any key image or key slogans, the Justseeds artists could fill in the gaps, drawing from the ever-expanding archive of downloadable creative-commons graphics. 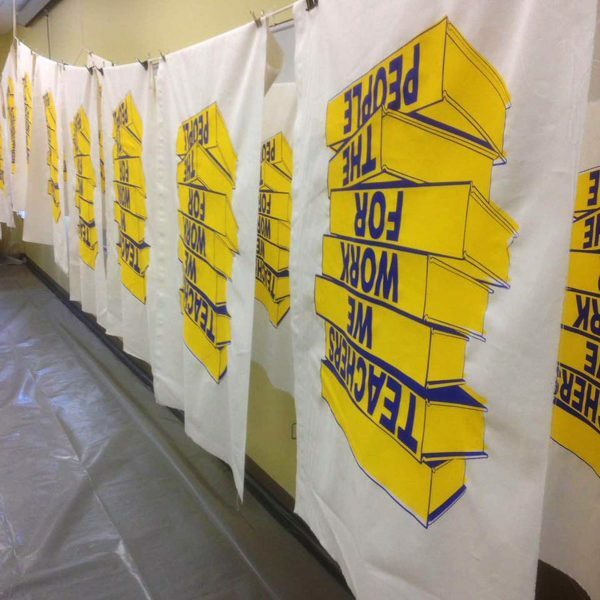 I took on the role of advising Nate what materials to order in advance, ideas on what type of art build space was needed, and once the images were decided upon by the union, I exposed the silkscreens that would be used for printing the picket signs. Nate, meanwhile, located the space, ordered materials, and established a volunteer list for filling in the shifts for the two-and-a-half day art build. 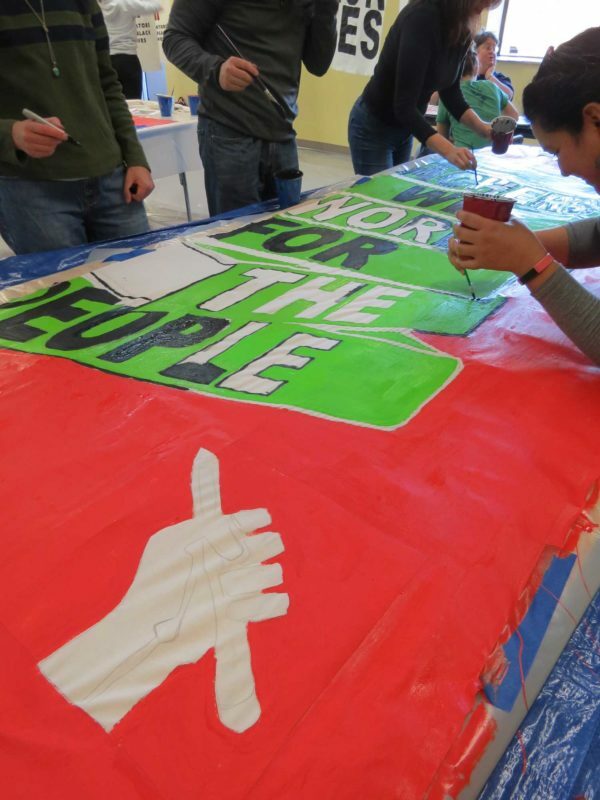 This was all-essential because the art build depends on people power and each four-hour shift having 20-40 people showing up ready to work for 4-6 hour shifts. The to-do list for the art build was ambitious: producing 300 screenprinted picket signs of eight different designs (all of which had to be assembled on eight-foot 1×2 wood poles, painting three 24 foot wide parachute banners of three different images, painting upwards of fifteen banners, silk screening 150-plus silk images of the Minnesota state outline on poster board that teachers and students could add their own message to with sharpie markers, silk screening 150-plus prints of a single image designed by Pete Railand that would be distributed to all of the sixty-five schools in the Minneapolis public school district and the fifty-five schools in the St Paul district. We also decided to print 1500 risograph images of three different designs that would also be distributed to all the schools. 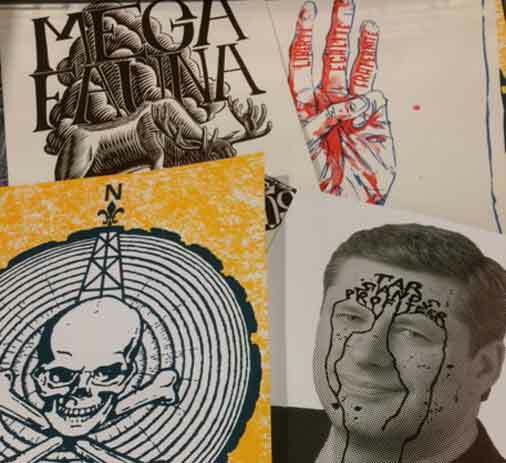 We reached out to Sam Gould – a Minneapolis-based artist who runs Beyond Repair – and he printed three images designed by Jesse Purcell, Susan Simensky Bietila, and Kyle McKinley. 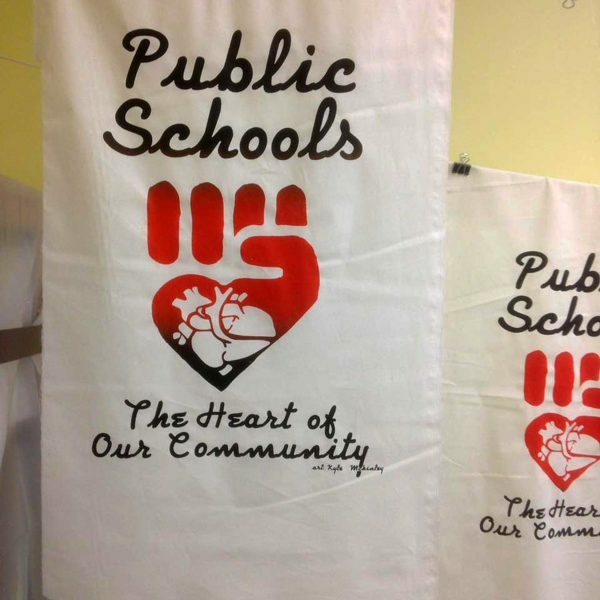 Kyle’s image of the heart and the fist (from the Justseeds graphics page) became one of primary images of the art build and was perfect for the union’s chosen slogan “Public Schools: The Heart of Our Community.” It was screened on thirty-five picket signs, painted on a parachute banner (note: the painting of the parachute banners was led by Kim Cosier of Milwaukee), and printed as a risograph image. The day before the art build Nate also sent me another request: could the Milwaukee crew design a “We Can Do It” image with the slogan “Teachers: We Work for the People.” Nate asked if we could use the original Rosie the Riveter image from the WWII-era, but Paul Kjelland stood firm: we could only do it if we had a new updated image of a woman making a muscle that connected it specifically to public education and the local organizing campaign. I suggested to Nate that he ask a co-worker – a teacher or a fellow union organizer to pose for the photo. Five minutes later Nate emailed me a photograph of one of his colleagues Catina Neal, an Education Support Professional who works as an organizer for the Minneapolis Federation of Teachers. Paul then created a graphic of the photo and I added the graphic design. I knew right after the image was designed that this one was special. 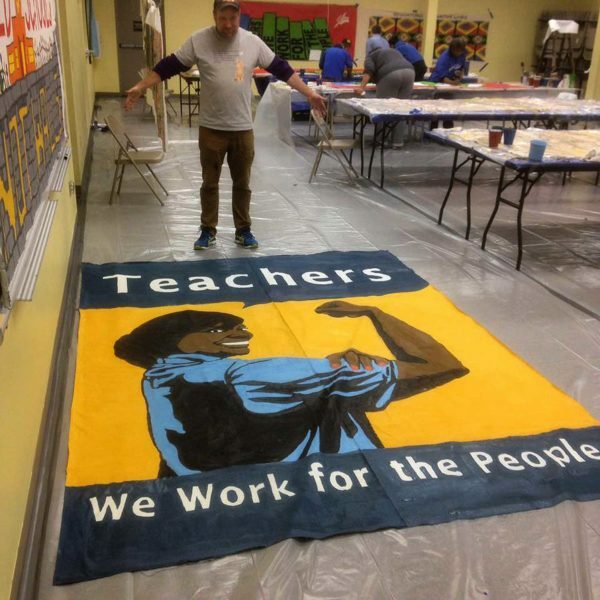 Nate and Michelle agreed and throughout the art build teachers and union organizers alike took photos of it and talked about it and the person represented with great pride and admiration. The union is even talking about painting the image as a mural on the exterior of the building once winter passes. This image highlights one of the many successes of the art build, but it was the preparation that took place months prior to the art build that allowed us to pull off an event of this scale. Each step matters: deciding on the images/ideas/slogans, securing a space, ordering material, designing the images, critiquing the images, revising the images, exposing the screens, preparing the art build space, lining up hundreds of people to take part in the event, and having extra materials on hand to allow last minute ideas to happen. 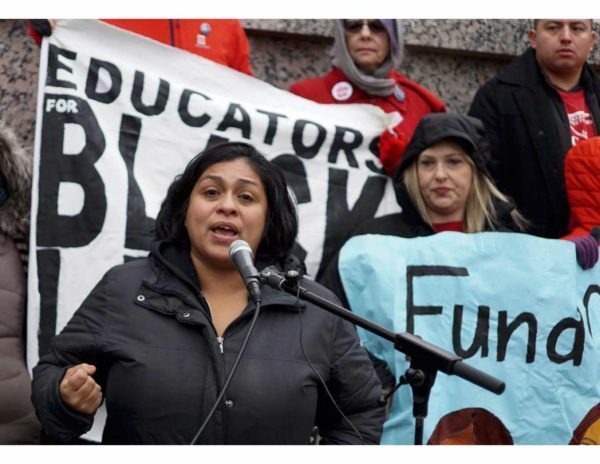 The Minneapolis and Saint Paul Federation of Teachers excelled at every step of the process. We had a massive to-do list and steps that had to happen on each day (Friday 4pm-10pm, Saturday 10am-10pm and Sunday 10am-8pm) but all the prep work ensured that the art build would be a celebratory event – a place for hundreds of people to work together, dialogue, network, create, and leave inspired and fired up to keep struggling for justice. 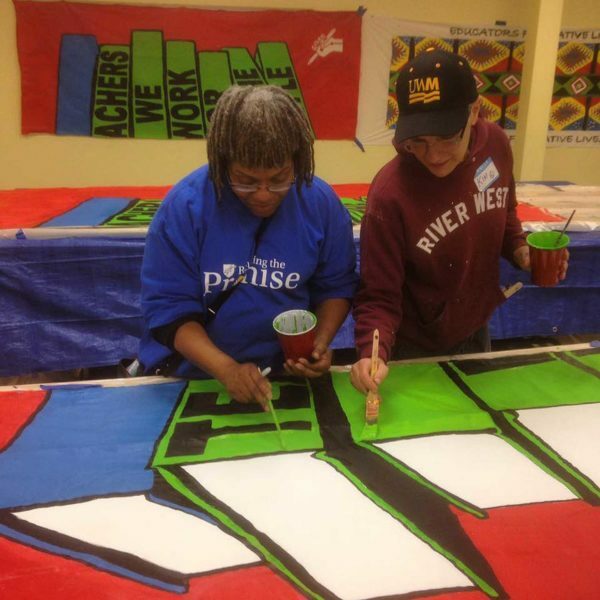 The Twin Cities organizers had decided to host the art build at the Minneapolis Federation of Teachers building in NE Minneapolis and this turned out to be a wise decision. The building had plenty of space and once plastic rolls were put on the floor to protect the rugs the space was more than ample to pull off an art build. I appreciated it held in the union hall because the space is already rooted in a history of organizing. Also, an art build held within the union hall changes how its members will come to view the building. They see it as a place where creativity and a multiplicity of voices are honored. I heard on multiple occasions teachers express how the art build held in the union hall made them feel welcomed as members. And now that the event has past the art build will be part of the spaces collective memory. It exudes a memory of positivity and embodies the social justice values of a union. 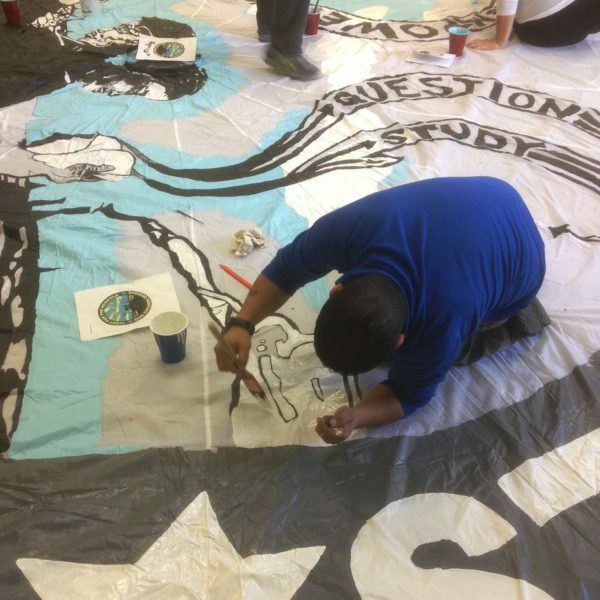 The art build being held in the union hall also changed the perspective on how non-union members and allies to public education might come to view the union. 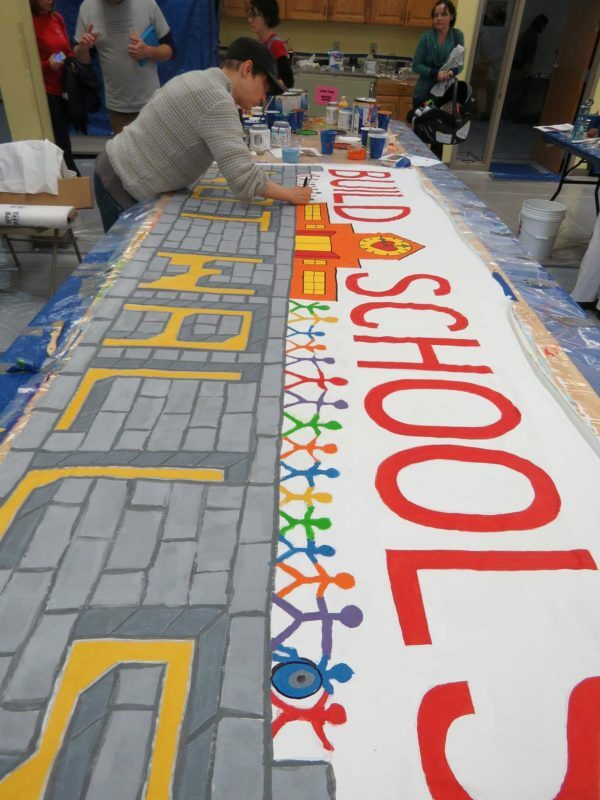 The art build was open to all and many others showed up to help out besides teachers and union organizers. 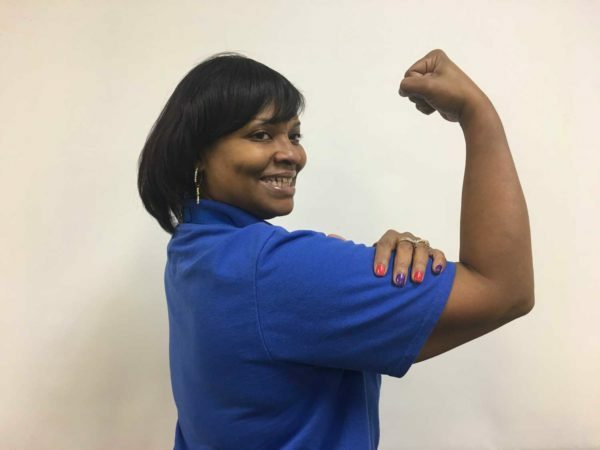 Those who took part saw a union committed to a multiplicity of struggles and an organization that is fighting in solidarity with movements across the city, state, country and world. 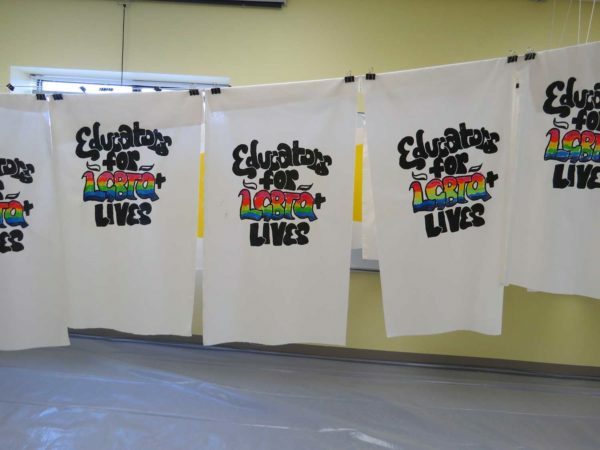 I saw on multiple occasions people from the community having their photograph taken in front of the banners painted – especially the Educators for Black Lives banners and the Educators for LGBTQ lives picket signs. If art can reframe (or introduce) an issue for the better, and art build can re-frame an organization to the public for the better and this was one of the great assets of hosting the art build at the union hall. 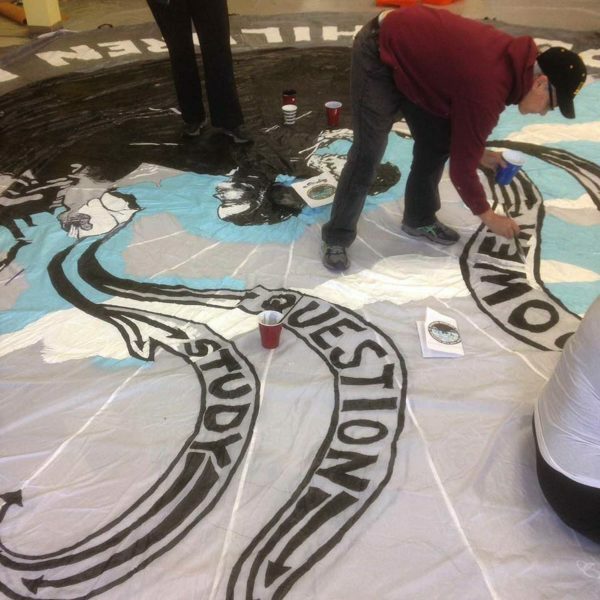 The Minneapolis art build was the second large-scale art build that we have organized for public education, but just one of many that we have done in the past three years, be it organizing for immigrant rights, climate justice, or many other intersected movements. 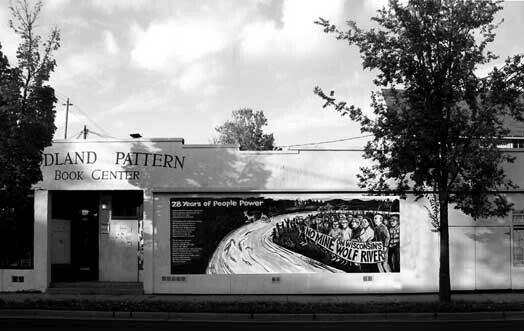 We have learned a lot from others – notably David Solnit in the Bay Area and People’s Collective Arts in Brooklyn – and I always think it is important to step back and consider why art builds matter. Art builds, at their core, energize those who take part in them. 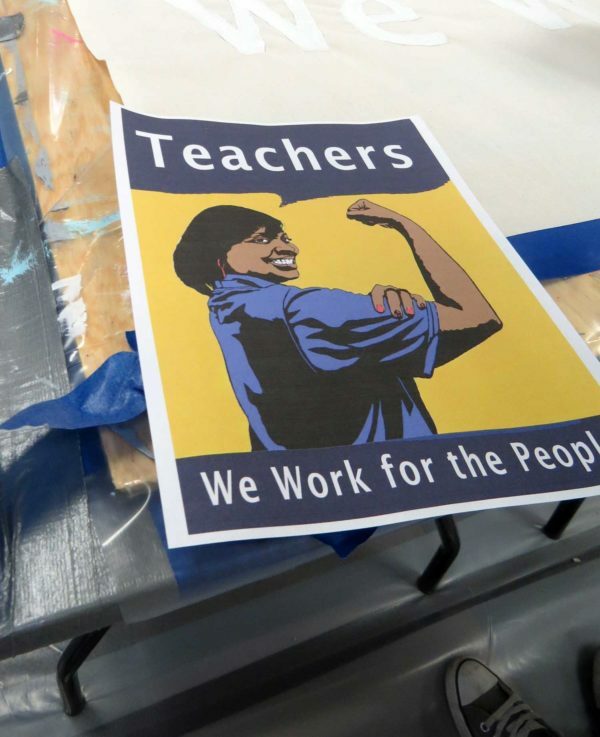 For three days teachers and union organizers created and were surrounded by banners and screenprinted signs that spoke of the power of their work, their values, and their struggle for justice. These events bring people together and forge solidarity. Because we had two locals working on the art build it fostered collaboration which will only create more unity in the months and years to come. 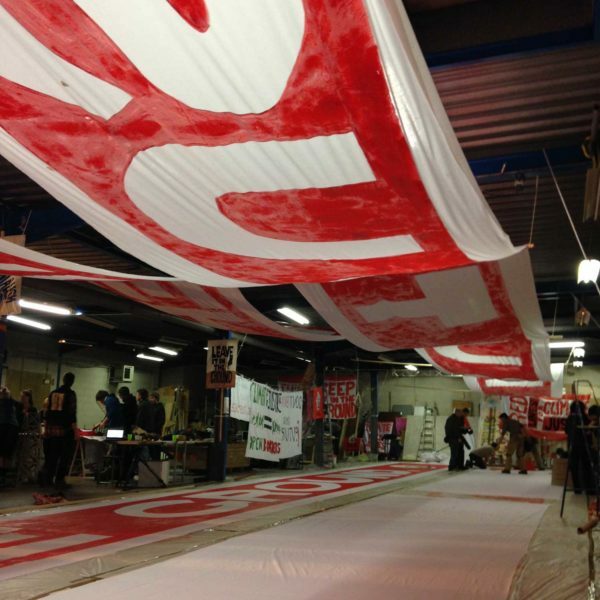 The banners, signs, and other ephemera created during the three days will provide the union with visuals for years to come. Not generic signs, but signs that are well designed and unique to the messaging the two locals wished to address. 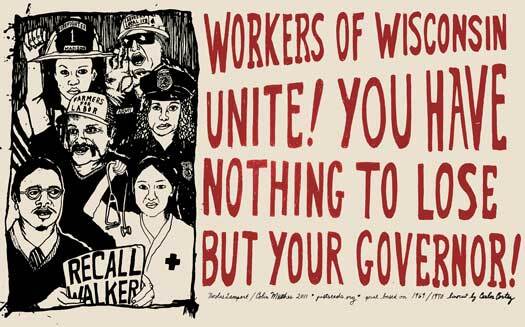 In short order the unions now have some of the best activist art at their disposal to amplify their message in the streets and at school board meetings. The two unions also have photographic documentation of the art build. The hundreds of photos taken during the art build were disseminated far-and-wide through social media and arguably those images will reach a larger audience than the actions when the art appears in the streets. 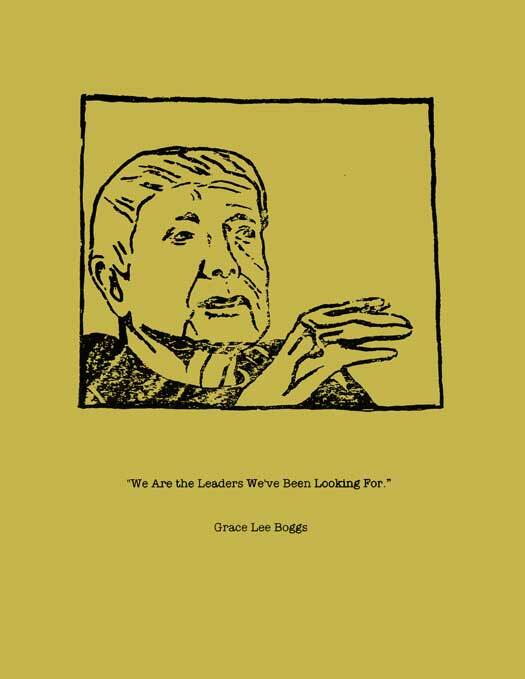 These images inspire and inform global audiences of the all-important work of organized labor. 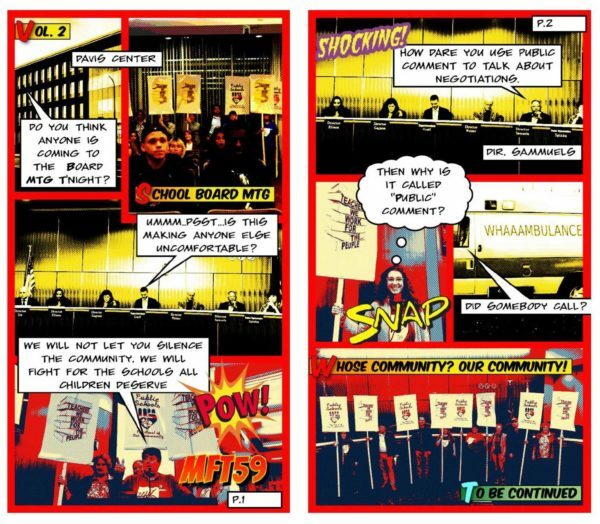 The art – both in the streets and via social media – amplifies the unions message and clearly articulates through images and slogans exactly what the union is fighting for. It shows that the union is standing with the people and that organized labor is one of the key defenses that we have in standing up to corporate power, privatization, and systemic oppression. The art build also allows for reflection. 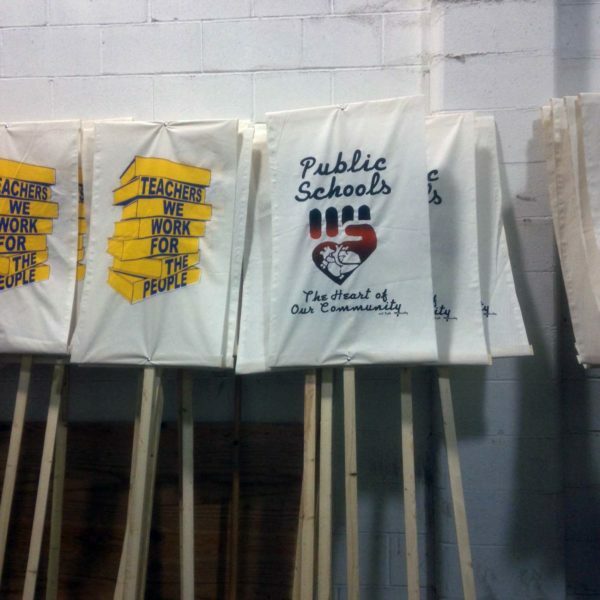 It allows the organizers – in this case the teacher’s unions – to consider the core principles that they are organizing for. 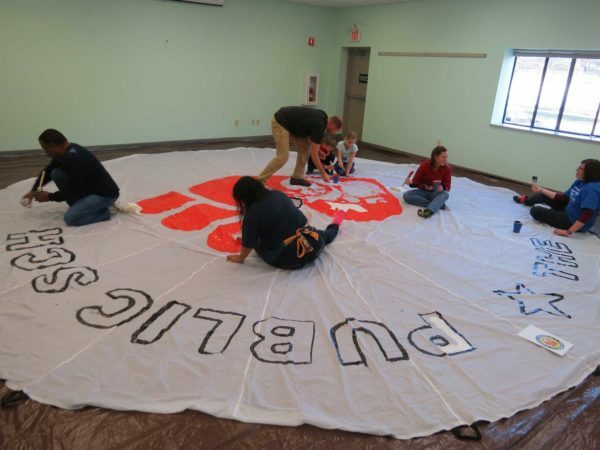 The decisions made a month prior to the art build when the slogans were chosen was all essential and the art build simply visualizes these key principles. The art build allowed the organizers to see which images and messages truly resonated and conversely which ones were missing and need to be addressed more in the future. And lastly, art builds are always places for surprises where new images can be made on a moment’s notice. 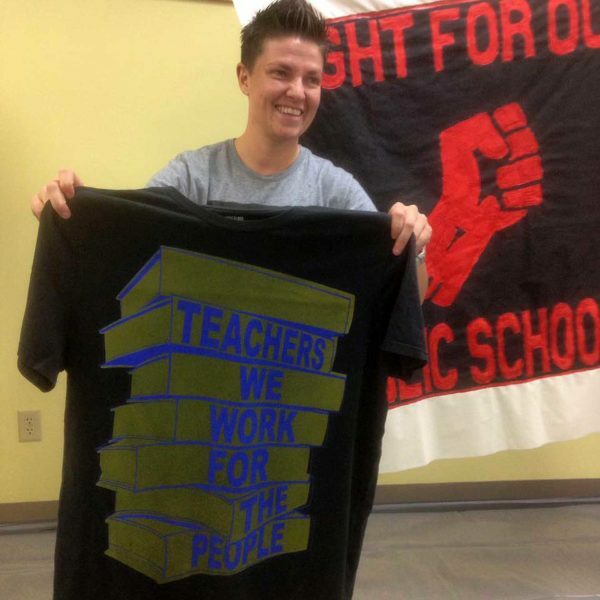 The image of Catina with the slogan “Teachers: We Work for the People” is a prime example. 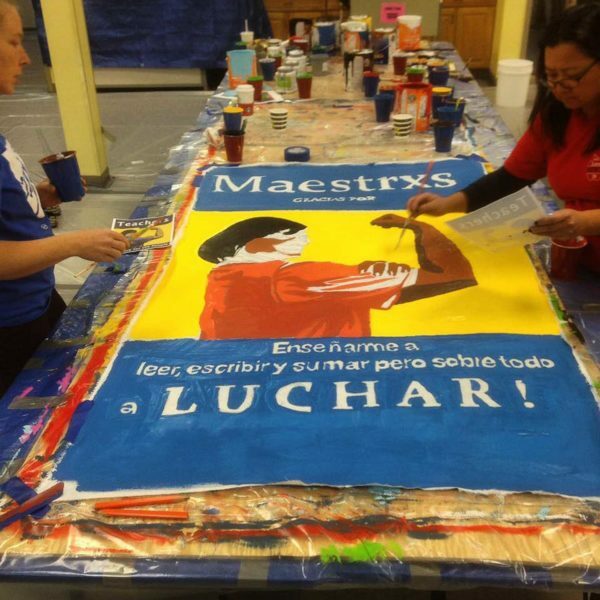 It was also an image that took on even more meaning when a teacher on the last day of the art build requested to paint a second banner of the image with Spanish text to further reach the diverse constituency of the Twin Cities public schools. 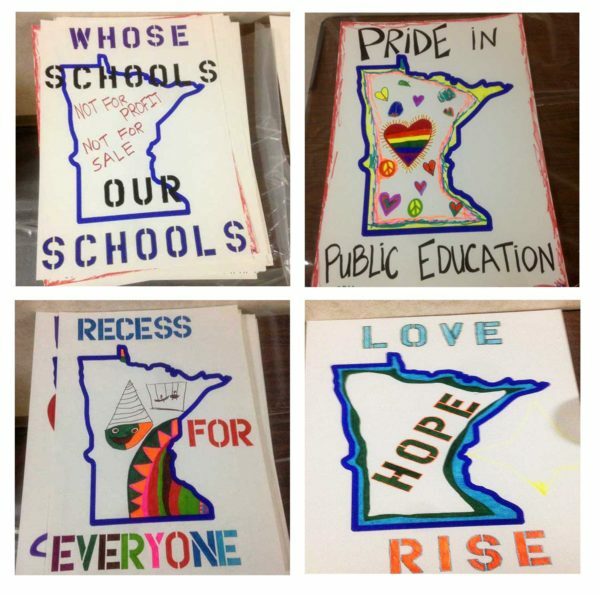 This image, and all the others, will be amplified by the teacher’s unions when they put them into action – which happened two days after the art build was completed at a demonstration demanding that U.S. Bank, Ecolab, and other Minneapolis companies pay their fair share of state taxes to better support local schools, communities, and workers. 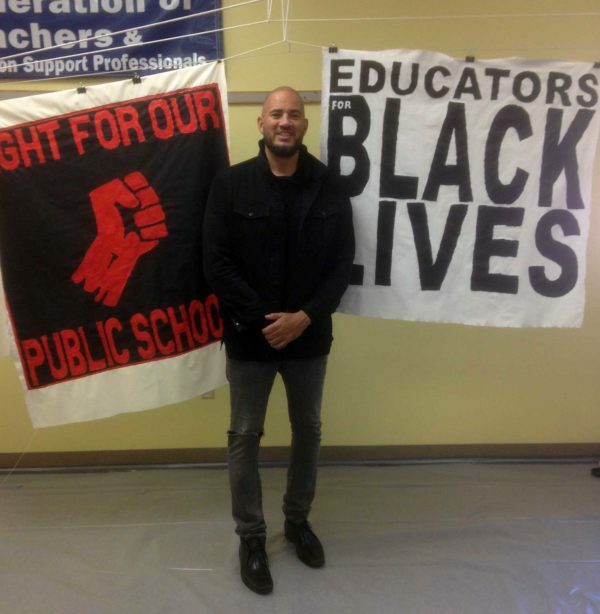 In closing, it was an honor to work with the Minneapolis and Saint Paul Federation of Teachers. It was a joy for the Milwaukee crew of myself, Kim Cosier, and Paul Kjelland to share the art build tactics that we have learned in our community with new allies in Minnesota. Here are some more photos from that epic weekend. And lastly, check out the new comic strip designed by Nate Gunderson! Absolutely amazing. Kudos to all involved. Education is the only hope for a sane future. Education, not indoctrination. Amazing!!! Here’s to supporting our teachers and school staff who support our children and community! Why shouldn’t our kitchenand classroom aides, custodians and others be treated with a fair just living wage! 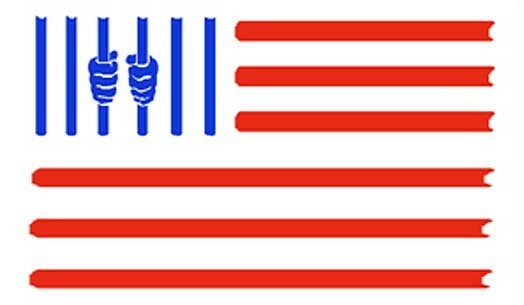 The War on Drugs is a War on….